For over 40 years, since the first Earth Day, we’ve been told to turn off the lights when we leave a room and turn off the water while brushing our teeth and that this would save the planet. I have never believed a word of it, even as I have dutifully followed the advice. I also recycle and compost and grow a bit of my own food… It just never feels like my small efforts can possibly make any real difference. For years, I have been waiting for real innovation. Something big. Bigger than windmills. Bigger than a few solar panels on the roof. Bigger than high speed rail. This kind of talk makes me feel optimistic about the future. This is the kind of stuff I wish our government would invest in. Native vs. Non-native Plantings. Bruce described the early days of Audubon by saying that they took turns “playing god,” that is deciding what to plant, what to cut, and what to allow to grow. Wildlife management strategies change over time as we learn the effects of our choices. In the early 1970s, folks weren’t as concerned with planting natives as we seem to be today. Sometimes non-natives do just fine if the habitat is right. Our Red Pine stands and Norway Spruces are all doing just fine. The same can’t be said of the White Birches that were planted along the Maple West trail. 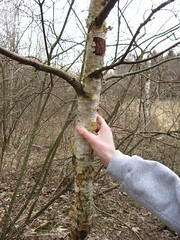 White Birch prefers deep, sandy soil like you might find in the Adirondacks… so while White Birch is native to New York State – it is not native to our region. The consequence of planting it in unsuitable habitat is unhealthy trees. All of our specimens are in pretty bad shape. The tree above has been infested with Bronze Birch Borer; you can see and feel the bumps caused by the larvae which are under the bark. Just to the east of the failed White Birch attempts are native trees that would naturally appear in this type of habitat: Quaking Aspen. When plants are matched to their habitat the are healthier. Duh. Plantings for Wildlife. 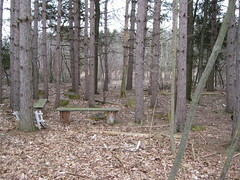 The Red Pines were planted to provide shelter for wildlife – birds in particular. Now that they are producing cones, they also provide food for Red Squirrels and other animals that dine on pine seeds. 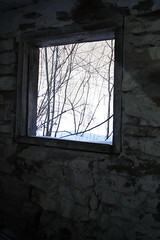 In the early days, other attempts were made to provide food for wildlife. “Volunteer” apple trees that were found growing in the goldenrod field were encouraged to grow and eventually provide fruit for turkey, deer, and others. The Red Oaks were planted with the idea that eventually they would produce acorns. American Chestnuts near the Red Oaks also provide some wildlife food, too. When selecting plants for wildlife food, there are 2 kinds to think about: those that provide a quick meal when the fruit is ripe – such as Serviceberry, also known as Juneberry and Shadbush. Serviceberries tend to be picked over pretty quickly by birds as soon as they are ripe. Thought should also be given to plants that will hold on to their fruits through the winter and provide food for early returning migrants. An excellent example is Staghorn Sumac. The fuzzy berries that remain through until spring provide valuable nutrition for returning thrushes, such as the American Robin, and plenty of other wildlife as well. A Farm Across the Goldenrod Field. If you are familiar with Audubon, imagine standing near Bob’s Garden (the Herb and Butterfly Garden) and being able to look across a vast goldenrod field to see the farmhouse near the picnic pavilion. 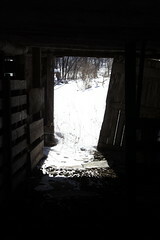 Bruce tells us that’s how it was in the early 1970s when Audubon first acquired the property. A few things were done to break up this huge Old Field and provide different kinds of wildlife habitat. Red Pines. First, three small stands of Red Pine were planted to provide a little height and attract something other than Red-winged Blackbirds. Red Pine (Pinus resinosa), while native to some parts of New York State, is not native to our regions. When you find Red Pines in our area, they are usually planted too close together and in straight rows. 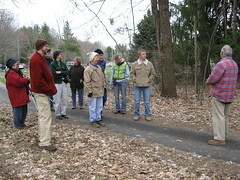 The first stand of Red Pines is just past the Herb and Butterfly Garden on the left (south) side of the Univeral Trail. There are benches and chunks of an old tree trunk. 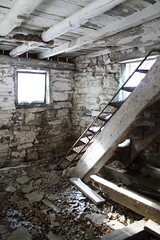 The kids love to play in here and turn over the “stumps” to find earthworms and sowbugs. To find the second, don’t continue on the Universal Trail when it turns right… instead go straight onto Maple West Trail and look to the right (north) of the trail. 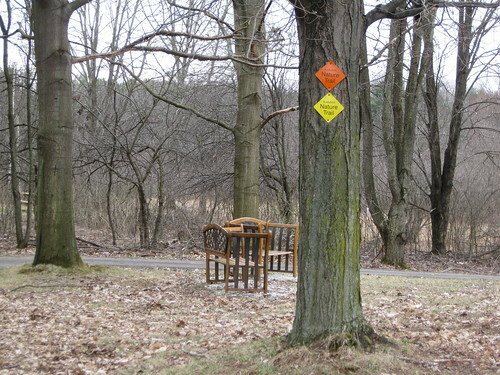 The third one is a bit further on – take a right at the Maple to the connector trail. 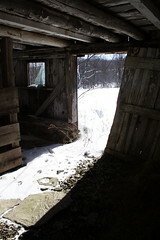 The stand will be on your left – the west side of the trail. A Lone Douglas Fir: Back between the first and second Red Pine stand there is a single Douglas Fir (Pseudotsuga menziesii) standing at the edge of the mowed area where we keep a couple of Bluebird boxes. 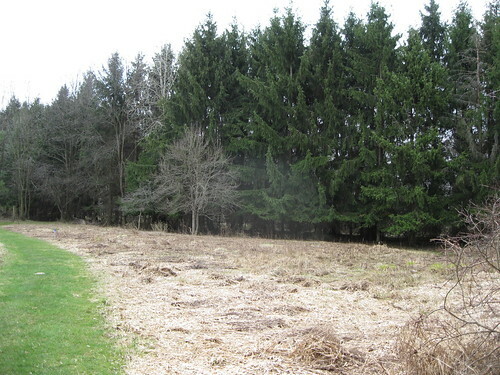 Bruce told us that it is the lone survivor of a planting of 15 or 16 Douglas Firs – planted at about the same time as the Red Pines and for the same reasons. The rest of the trees in this planting became deer food. This one somehow managed to survive despite deer browsing, but is not a stellar example of a Douglas Fir. Instead of standing as a single tall trunk, this one has multiple trunks – and a very distinct browse line! 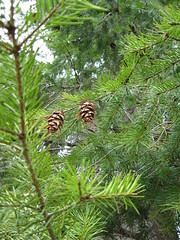 Douglas Firs have very distinctive cones, and the needles smell pleasantly citrusy when you break them. 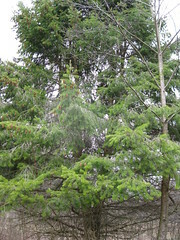 Douglas Firs are native to North America, but to our region. In fact, in most of the sources I checked, Douglas Fir is shown as strictly a western tree. Only the USDA Plant Database shows supposedly native populations east of the Rockies. Norway Spruce: If you could fly above the sanctuary near Riverside Road, you would see a long S-shaped stand of Norway Spruce (Picea abies). Bruce remembers planting that row under the direction of Ted Grisez who wanted it for two reasons: (1) to screen the view of the farmhouse, and (2) to provide a backdrop for the Arboretum. Norway Spruce, native to Europe, have naturalized in north central U.S. and adjacent Canada. In other areas where you find them, they are probably planted. 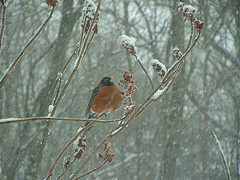 Look for dramatically drooping branches (all the better to shed snow, my dear) and long cones with stiff scales. 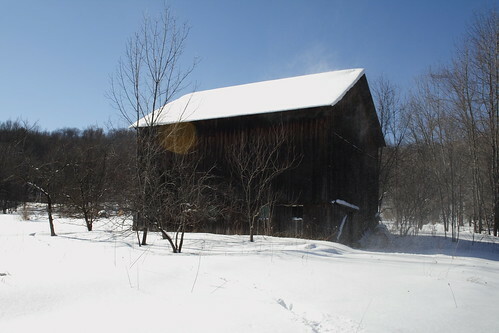 Bruce Robinson remembers a time when a group standing in this spot could look across a goldenrod field and see the farmhouse on Riverside Road. 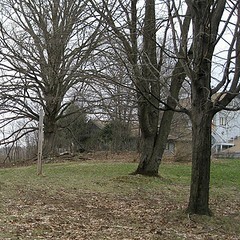 He remembers planting a Sugar Maple and a couple of Red Oaks at the curve of this path on what would become the “lawn”. He remembers digging long straight trenches to divert water away from paths and a long S-shaped trench in which to plant Norway Spruces – a backdrop for the future Arboretum. He remembers differences of opinion about what should and shouldn’t be planted. The Sugar Maples (and Red Oaks… and a Couple of Cherries). There is a Sugar Maple that sits on the hill on the southwest side of the Nature Center building. It is enormous. It is old. It is regal. 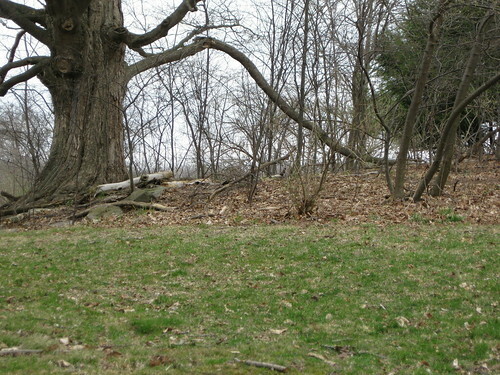 When Audubon acquired this property in the 1970s and began developing it as a wildlife sanctuary, there were many discussions about that tree. How can we showcase it? How long will it last? What plans should be made for its eventual demise? 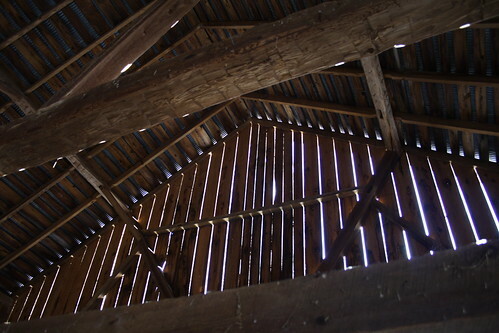 If you look under the Big Maple today you will see that it is “kind of a mess,” to use Bruce’s words. He assured us that the messiness was intentional from the very start. The 30-40 species of plants that grow under the Maple do two things: (1) They provide shelter for wildlife. Indeed, we often see chipmunks, squirrels, and rabbits run for cover when we approach with a group of children. (2) They serve to discourage people from getting too close to the tree by providing a little buffer zone. 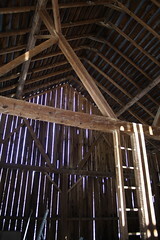 Back in the 1970s, it was evident that Big Maple had been “in decline” for many years. Bruce assured Audubon founding members that it was sure to be there for another fifty years. He assured us the same thing today. Tree time is so much different than people time… Still, knowing that no tree can live forever, a new Sugar Maple was planted to take the place of Big Maple – some day… generations later. Two Red Oaks were planted the same day. You can’t tell from this picture, but the Sugar Maple in the foreground (with orange and yellow signs) has a trunk only 1/2 or 2/3 the size of the Red Oaks in the background, although they were all planted on the same day. Natural succession provided a couple of trees that are undesirable from Bruce’s perspective – one on the north side of the trail between the two Sugar Maples, and one on the south side of the trail near the Red Pine Stand. 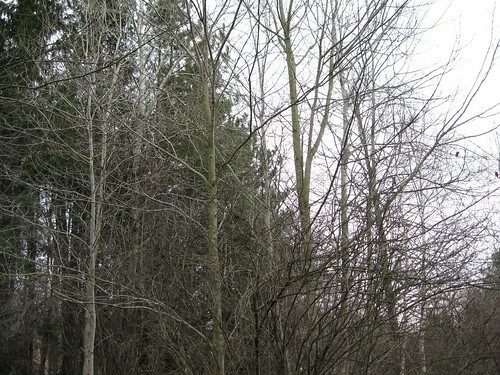 The Black Cherries grew faster than the new Sugar Maple and are now taller, stealing sunlight. 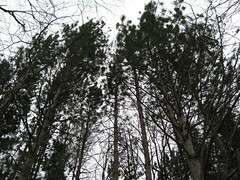 Both sport a feature often found in new forests – forked trunks. In a new forest where there is plenty of sun, trees often produce forked trunks giving them larger canopies – more leaves for doing the work of photosynthesis. 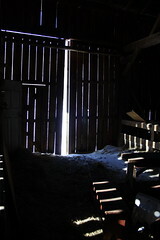 As the forest grows around the fast-growing Cherries, competition for sunlight increases. 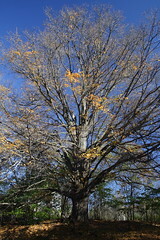 One of the trunks falls away so that the tree can spend its energy getting taller – getting its leaves up to the sun. Bruce predicted that left alone, each of these Cherries will lose a trunk sometime in the next 4-5 years. 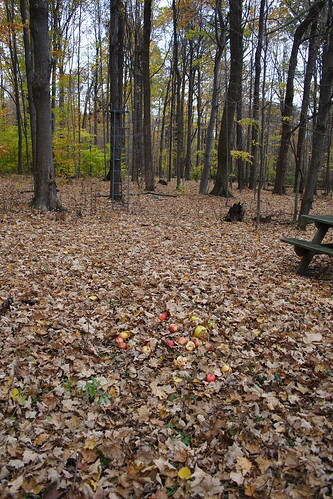 He also expressed his opinion that the Cherries should be taken down to encourage the Sugar Maple. I’ve been thinking a lot about signs lately… I like the one in this picture better than the “Posted: No Trespassing” variety. In case you can’t read the tiny writing, it says, “Wildlife Safety Zone”. Before I get into it, understand that I have nothing against hunting. Especially deer hunting! Deer in our parts have no natural predators anymore. We rely on human hunters to keep populations in check. In fact some areas are so overpopulated with deer that the habitat suffers. Why can’t people follow the rules?